Special Summon 4 "Sheep Tokens" (Beast/EARTH/Level 1/ATK 0/DEF 0) in Defense Position. They cannot be Tributed for a Tribute Summon. You cannot Summon other monsters the turn you activate this card (but you can Normal Set). A scapegoat is a term used to refer to an innocent person who is unjustly blamed for a wrongdoing and/or unjustly punished. The term originated from the Jewish custom of sacrificing a goat (representing the sins of the people) by driving it off into the wilderness as part of the ceremonies of Yom Kippur. Stray Lambs, which Summons Lamb Tokens (which can be Tributed for Tribute Summons) instead of Sheep Tokens. Scapeghost, a Zombie-type Flip monster which summons Black Sheep Tokens when flipped face-up. White Magician Pikeru wears a white-Sheep Token hat. All Sheep Token card artworks show them exactly as they appear in this card's OCG/TCG artwork (except for the pink version, which is rotated). 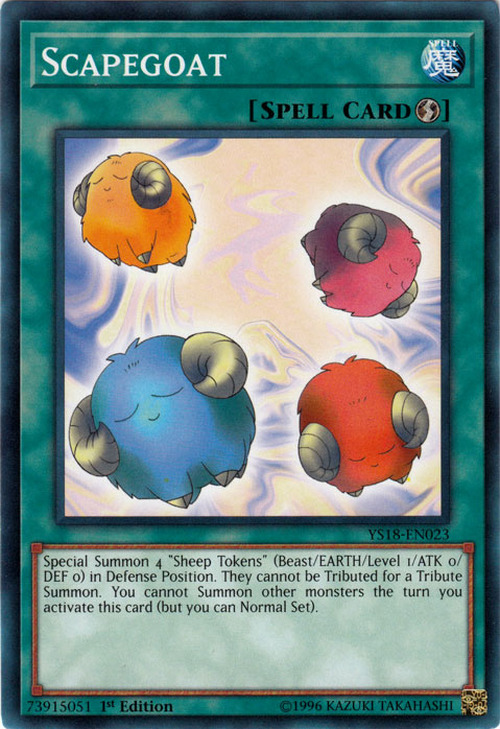 The artwork design of the Sheep Tokens in this card's OCG/TCG artwork are taken from , specifically from the panel showing 4 Sheep being Summoned by this card. Bone Temple Block: If your opponent is under the effects of “Scapegoat” and cannot Special Summon, you can still activate “Bone Temple Block.” In this case, only you would Special Summon a monster. Inherited Fortune: You can activate “Inherited Fortune” even if you cannot Special Summon at the time, such as if you activated “Scapegoat” this turn or “Archlord Kristya” is on the field. During a turn in which "Scapegoat" was activated, the effect of "Gallis the Star Beast" cannot be activated. : If you cannot Special Summon because of the effect of "Scapegoat" etc, can the effect of "Gallis the Star Beast" be activated? If "Scapegoat" is Chained to the activation of "Gallis the Star Beast", then the effect of "Gallis the Star Beast" still resolves, and you send the top card of your Deck to the Graveyard. However, if the sent card is a monster, then after inflicting damage "Gallis the Star Beast" is destroyed and sent to the Graveyard. You can activate "Bone Temple Block" after your opponent has Special Summoned by "Scapegoat". Only you will Special Summon a monster from the Graveyard. : Please explain the effect of "Bone Temple Block". 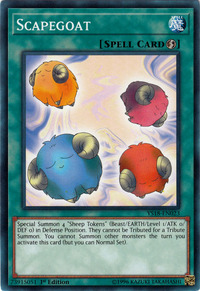 You can Special Summon "The Atmosphere" by removing from play a Token Monster, such as a "Sheep Token". : Can a Token Monster be used when Special Summoning a monster like "The Atmosphere" or "Red-Eyes Darkness Metal Dragon"? If you activate "Monster Reborn" and your opponent chains "Imperial Order" you can chain "Scapegoat" and "Royal Decree", but only "Scapegoat" will resolve since "Scapegoat" will prevent any Special Summons, and therefore, "Monster Reborn" cannot resolve. Asura Priest:" "Asura Priest" cannot attack a monster if it has already attacked directly this turn. For example, the opponent activates"Scapegoat" after "Asura Priest" has completed a direct attack. Black Garden:" If you control "Black Garden", when you activate "Scapegoat" the effect of "Black Garden" will activate after your "Sheep Tokens" are Special Summoned, but its effect will disappear. If instead, your opponent activates "Scapegoat", after they Special Summon their "Sheep Tokens" the effect of "Black Garden" activates, and when it resolves you will Special Summon the Rose Token. Chain Disappearance:" The effect of "Chain Disappearance" can remove multiple monsters that are Summoned simultaneously, for example if your opponent activates "Scapegoat", you can respond with "Chain Disappearance" to remove all 4 "Sheep Tokens" that were Special Summoned from the field. Cocoon Veil:" You cannot activate this card if you cannot Special Summon a monster due to the effect of "Scapegoat", etc. Conscription:" If you cannot Summon because you activated "Scapegoat"that turn, you cannot activate "Conscription". Goldd, Wu-Lord of Dark World / Sillva, Warlord of Dark World:" "Goldd, Wu-Lord of Dark World" / "Sillva, Warlord of Dark World" must be Special Summoned to resolve the second part of his effect. If you cannot Summon him because you activated "Scapegoat" that turn, or your Monster Card Zones are full, then the second part of his effect does not resolve. Hero Counterattack:" You cannot activate this card if you cannot Special Summon a monster due to the effect of "Scapegoat", etc. Jam Breeding Machine:" You cannot activate "Scapegoat" if you have this card active on your side of the field. Jowgen the Spiritualist:" While this card is on the field neither player can activate "Scapegoat"
"Light and Darkness Dragon": If you cannot Special Summon a monster because of a card’s effect (“Scapegoat”, etc.) when “Light and Darkness Dragon” is destroyed and sent to the Graveyard you will not be able to Special Summon the selected monster but you must still destroy every card that you control. Metamorphosis:" You can Tribute a Monster Token (including a Sheep Token from "Scapegoat"). Morphtronic Celfon: If you cannot Special Summon a monster (due to "Scapegoat", etc. ), you cannot activate "Morphtronic Celfon's" Attack Position effect. Ojama Trio:" You cannot activate "Ojama Trio" if "Scapegoat"is preventing you from Summoning. Reasoning:" You cannot activate "Reasoning" if you already activated "Scapegoat" this turn. Spatial Collapse:" While "Spatial Collapse" is active and you have 1 or more cards already on your side of the field, you cannot activate "Scapegoat" because you would have your 1 previous card + the "Scapegoat" card + 4 monster tokens = 6. The Last Warrior from Another Planet:" Neither player can activate "Scapegoat"
Torrential Tribute: ""Torrential Tribute" can be activated after a monster is Summoned through another card's effect, such as"Scapegoat"
Twin-Headed Behemoth:" If "Twin-Headed Behemoth" would be Special Summoned by its own effect, but your Monster Card Zones are full, or the effect of "Scapegoat" prevents you from Summoning, it still considered that its effect was activated, and you cannot use it again in the current Duel. Vanity's Fiend:" Cards like "Scapegoat"cannot be activated while "Vanity's Fiend" is on the field. Wild Fire:" You cannot activate "Wild Fire" if you are prevented from Special Summoning monsters, due to an effect like "Scapegoat".